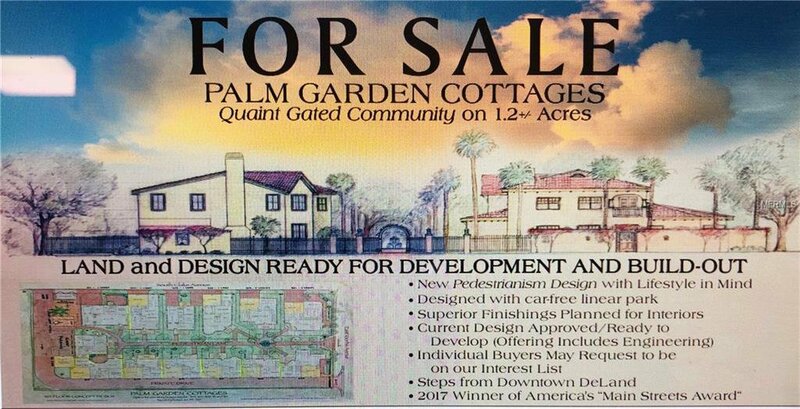 Palm Garden Cottages Planned Development — A New Pedestrianism design, a more pedestrian- oriented version of New Urbanism. Prime Downtown DeLand land with approved plans, survey, engineering. Seeking purchaser/ developer ready to build 13 homes one half block from the Main Street and two blocks from the center of town. Walking distance to hundreds of amenities and attractions. Houses with front porches to be built on the New Pedestrian model with houses facing a linear park consisting of a paved lane and fountain.